There are several different movements that share their not representative depiction in the works of art. Among them there are Abstract Expressionism, Informalism, Art Brut, CoBrA and Lyrical Abstraction. It developed between the 1940’s and the early 1960’s. It was an American post WWII movement. After seeing the images and photographs of the war, the artists decide to explore colour and shape. These works of American artists were a kind of competition with the Europeans who translated to the USA as refugees during and after the war. The artist combine the emotional intensity and self-expression of the Expressionist with the anti-figurative images of other Avant-Garde movements. It can be divided in two groups: Action Painting and Colour Field and Hard-Edge. The movements found some parallel in other European movements. Action Painting is a term that was used by the first time to describe Jackson Pollock work. This artist, the same as Franz Kline or Willem de Kooning used their psyche as the driving force for their works. The canvas was seen as an arena and painting was irrational, instinctive and impulsive. Colour Field and Hard-Edge are two formal trends in American abstraction in the early 60’s. Colour Field consists of large coloured areas, without signs or forms that the eye can catch. Colour was used without any perspective, producing a sensation of impressive size. The shades of colour were diluted into the canvas. On the other hand, Hard-Edge described some works in which colourful atmospheres were emphasised. The works have clearly defined outlines and edges and the precision clarify the compositions. Representative of this movement are Rothko, Barnet Newman, Ellsworth Kelly, Morris Louis, Kenneth Nolan. After WWII some painters contemplated geometric abstraction as a load and the cold intellectualism, out of touch with the reality of poverty and despair. Spontaneity and authenticity were more meaningful to the new generation of artist. From this reaction was born a new painting style fully abstract that was the result of the artist’s emotional and physical engagement. 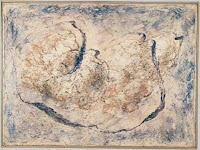 The term was coined to classify the work of Jean Dubuffet, Willem de Kooning, Jean Fautier and Alberto Burri. The informalists were not interested in having a total control over the processes of artistic work but in emphasizing spontaneity, irrationality and freedom of form. They sought out rebellious tools and paints, capable of producing things accidental and unexpected. He aimed at escaping from the prison of traditional art. 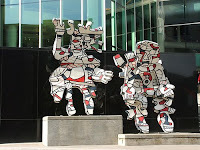 This style was created by Dubuffet at the beginning of 1945 out of the official culture. He focused in the art of the insane. It is inspired in the art production of a insane asylum. Dubuffet created the Collection de l´Art Brut, containing works of these non professional artists. In Dubuffet’s word Art Brut was “those works created from solitude and from pure and authentic creative impulses- where the worries of competition, acclaim and social promotion do not interfere- are, because of these very facts, more precious than the production of professions. After a certain familiarity with these flourishing of an exalted feverishness, live so fully and so intensely by their authors, we can not avoid the feeling that in relation to these works, cultural art in its entirety appears to be the game of a futile society, a fallacious parade”. It was a post WWII European Avant-Garde movement. The name comes from the three home cities: Copenhagen, Brussels and Amsterdam, which are respectively the head, body and tail of the cobra snake. The group was founded by Asger Jorn, Alechinsky and Karel Appel among others. When Europe was devastated these artists wanted to unite their forces and react to the inhumanity of a civilization based on reason and science. The group has a political and social dimension based on a criticism of the Cold War society. In the group met old members of the Amalgamation Dutch group, the Danish Host and the Belgian Revolutionary Surrealist. Their values are nonconformity and spontaneity. Their inspiration were children drawings, the alienated and folk art, motifs from Nordic mythology, Marxism. They rejected erudite art and all official art events. They aimed at expressing a combination of the Surrealstic unconscious with the romantic forces of nature by using an abstract language. They were distinguish by painting with brilliant colour, violent brushwork and distorted human figures. 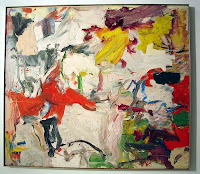 It is a French style of abstract painting that developed between 1945 and 1960. 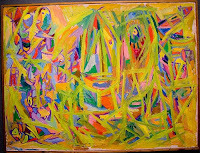 It is very close to the Art Informel and to the Abstract Expressionism. It was created by the painter Georges Mathie who wanted to separate cold geometric abastraction from a hot organic and lyrical form of abstraction. 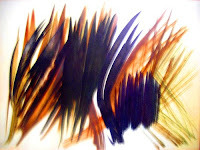 Hans Hartung is one of the members of this group. For him painting means streaking, hatching and brushing until the canvas is throughly invaded. He did, disguised and erased an image until all that was left were the deletions.